The second shirt we see Dean wear in the series. It’s a denim blue colour. I’m just going to go ahead and assume that Dean replaced his denim shirt from S1 with one similar, and not count it as a continuity error. I don’t know about your country – but in North America it is pretty easy to pick up a denim shirt at a thrift store. 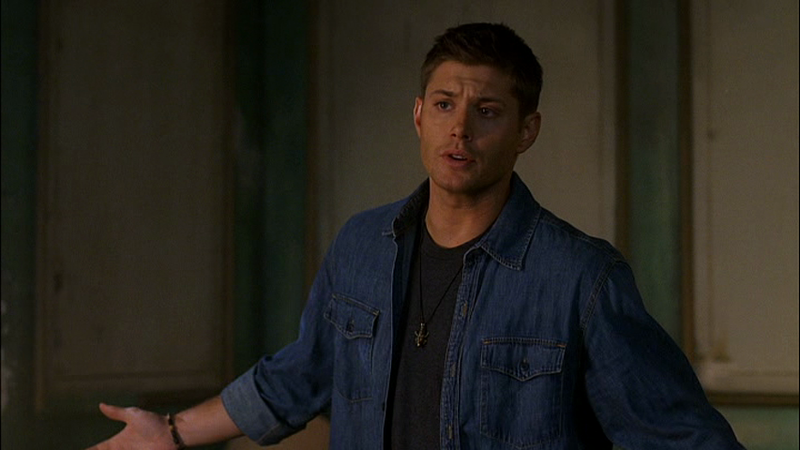 And I really think that the paramedics in the S2 opener would have completely destroyed Dean’s previous denim shirt. 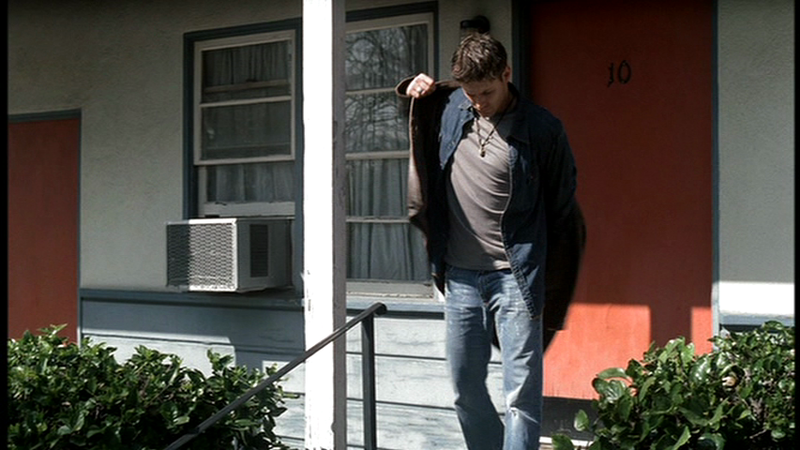 In the Pilot (1x01), Dean changes into the denim blue shirt after he showers all the mud of himself and wears it for the rest of the episode. It could have possibly been in John's possession before this. In Hell House (1x17), Dean wears it when he and Sam check out the Hell House for the first time and do their preliminary research. Dean wears it for the final scene in Dean Man’s Blood (1x20), when his Dad comes to their motel room and agrees that they should work together, and then keeps it on for the entirety of Salvation (1x21) and Devil’s Trap (1x22). In the opening of In My Time of Dying (2x01), the paramedics have removed Dean’s shirts before they load him into the ambulance. It next appears in Heart (2x17). Dean wears it while he and Sam are spending the night at Madison’s making sure that she doesn’t turn. He changes shirts after leaving Sam and Madison alone when they think that she’s cured. In What Is And What Should Never Be (2x20), Dean wears it at the end of the episode when he and Sam are talking in the motel room. In Sin City (3x04), Dean wears it from the beginning of the episode until Ritchie is killed. In Red Sky At Morning (3x06), Dean is wearing this shirt when he and Sam are researching and Bella arrives to tell them about the hand of glory. Dean then wears a tux for a bit, but puts on the this shirt again after he changes out of it – and leaves it on until he gets soaking wet in the graveyard rescuing Bella. 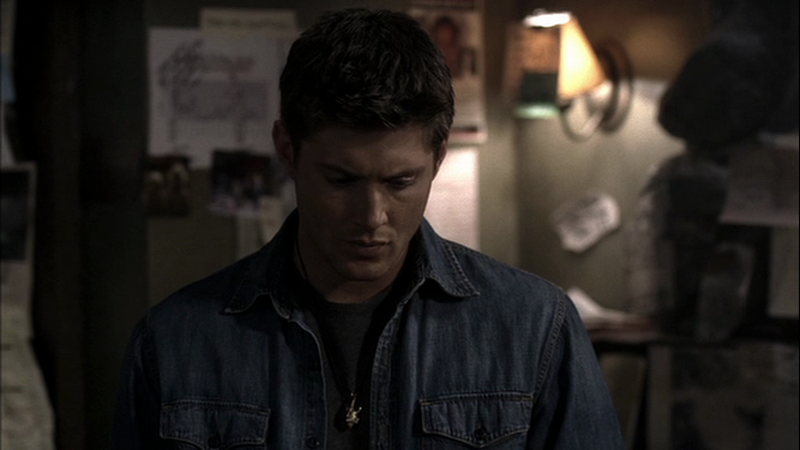 In Mystery Spot (3x11), Dean wears it on both Wednesdays. In Jus In Bello (3x12), Dean is wearing this shirt when Ruby finds them in the motel room at the end of the episode and shows them the news about the police station. In Long Distance Call (3x14), Dean wears it once they’re in their motel room after interviewing the widow of the first victim. He keeps it on until after “John” calls him while Sam is sleeping. In Metamorphosis (4x04), Dean wears it for the drive to Carthage, the initial stake-out of Jack Montgomery’s house, and when they see Travis for the first time back at their motel room. In Death Takes a Holiday (4x15), Dean wears it from when he is nursing his concussion (from Alistair throwing him around the graveyard) until the end of the episode. In Of Grave Importance (7x19), Dean wears this shirt when he and Sam go to meet Annie for lunch, he wears it for the rest of the episode, except, of course, when he is in the shower. In Heartache (8x03), Dean wears this shirt after they interview Eleanor Holmes the first time, and keeps it on until they solve the Brick Holmes mystery. He changes out of it before they confront Eleanor with what they know. 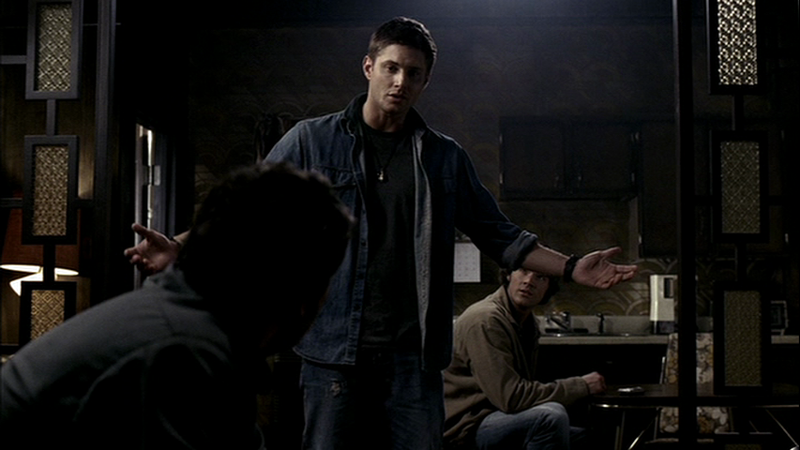 In Hunteri Heroici (8x08), Dean wears this shirt when we first join the Winchesters and Castiel at the Gas’nSip. In Remember the Titans (8x16), Dean is wearing this shirt when he, Sam, Prometheus, Haley, and Oliver arrive at the bunker to wait for Oliver’s resurrection and research how to break the curse. He wears it until the end of the episode. In Taxi Driver (8x19), Dean wears this shirt from the beginning of the episode until Kevin steals his pie. In Sacrifice (8x23), Dean wears this shirt from when they pick up the demon tablet until the end of the episode. Dean is still wearing this shirt in I Think I’m Gonna Like It Here (9x01). He wears it for the entire episode. In Devil May Care (9x02), Dean is STILL wearing the shirt for the opening scene, when he shows Sam that Crowley is in the trunk. He changes before they arrive back at the Bunker. In Holy Terror (9x09), Dean is wearing this shirt when he gets Cas’ call and is informed that Ezekiel is dead. He wears it until the end of the episode. In Road Trip (9x10), Dean is still wearing this shirt when he gives Kevin a funeral and then has an emotional breakdown in the bunker. He changes before Cas arrives. In Alex Annie Alexis Ann (9x19), Dean wears this shirt from when he and Sam arrive in Sioux Falls until they escape the vampire nest after Jody rescues Alex. In Reichenbach (10x02), Dean wears this shirt from the beginning of the episode until he kills Lester. In Safe House (11x16), Dean wears this shirt when he and Sam are researching the lore and Bobby’s old journals in the hotel room. He also wears it when he and Sam dig up the graves only to discover that Bobby and Rufus already torched them both. In The Foundry (12x03), Dean is wearing this shirt when they are researching in the motel room. He keeps it on until the end of the episode when they return to the Bunker and Mary leaves. FATE: It gets severely bloodstained in Devil’s Trap (1x22) and removed (possibly cut away) from Dean by the paramedics during In My Time of Dying (2x01). sorry, having a shallow moment. i'm good. I was cruising around the web and found what I think is this shirt.The wardrobe people would have had to remove the Levis' tab though. This site also says the shirt's from the '60s which kind of supports the notion that it was one of John's old shirts. Oh wow, that's awesome - good find! I want to say that's the same shirt, but it's not. You can tell from the pockets and the colour is too blue.